Last night in London,top headphonesand mics brand Sennheiser put on a concert with the German young peoples' orchestra, playing the works of Reich, Glass, Ligeti and others and then accompanying Pound Shop Kate Bush, Imogen Heap. But it also announced a pair of flagship headphones so special that it actually barely announced anything about it at all. Was this the canniest PR sinceSteve Jobs' first "One more thing"?Or was it quite perplexing and vaguely annoying? We don't know. 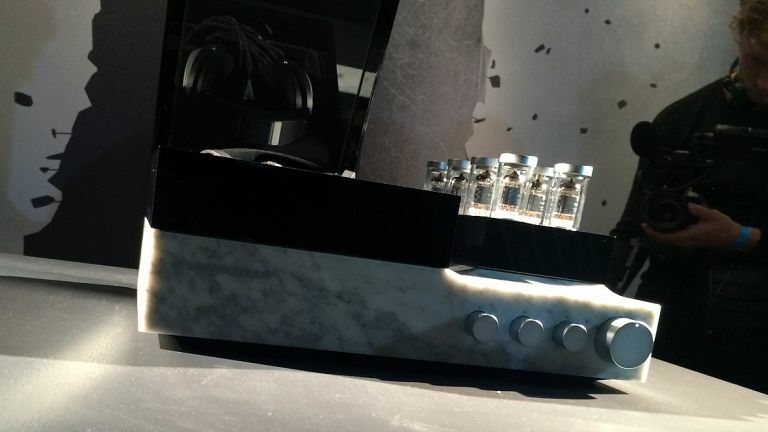 What we do know is that it's a headphone amp where the electronics are embedded in a huge slab of marble, "the same as Michelangelo would have used," (had he been a headphone engineer). We know that it has a frequency range from 8Hz to 100KHz, which is miles beyond the range of human hearing in both directions, but very good news for audiophile bats at the top end, and elephants, supposedly, at the bass end. And we know that atomised platinum is involved in the headphones part of it, somehow. We also know that Sennheiser deliberately lit it so it was really hard to photograph. So that's nice. What we don't know is what it's called, how much it will cost and when it's coming out. A Sennheiser spokesman did coyly state that it might be produced at "a rate of one per week" and that it would come out "within months rather than years". He also pointedly asked, "Where do you think Sennheiser currently sits in the market?" To which we said, "Not at the super-high, luxury goods end", to which he sort of said, "Mmmm," although he might have just been clearing his throat. So, we reckon about £50K, out by Christmas and it might be called something like "Xerxes" or "Zeus", because the last venture Sennheiser made into the luxury market was with the Orpheus, which cost about £10,000 back in 1991. The launch, at London's very presitigious and subtly marble-festooned Westminster Central Hall was an extremely swanky affair, and this is clearly not a product for the masses. It's for Dr Dre himself, not for people who wear his headphones. Although if you got lackeys to wheel it down the road behind you, along with a generator, while you wore the headphones, you would have the most blinging "portable" music system of all time, homes. The concert, introduced by the Sennheiser brothers themselves (Andreas and Daniel), was excellent by the way, and was "recorded in 3D" for posterity. T3 left completely baffled, but impressed nonetheless.